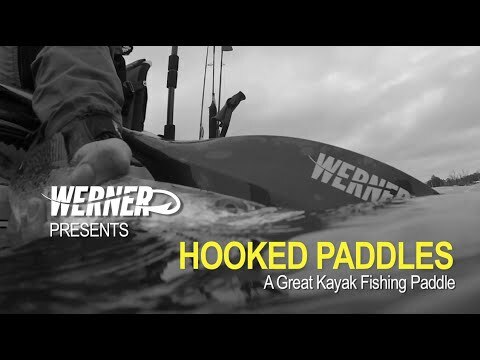 The Werner Shuna Hooked Kayak Paddle is a great new angling paddle. The best angling paddle is of course the best paddling paddle and the Shuna is one of Werner's most popular high angle paddles. It's powerful yet light and durable and great for active or relaxed paddling. The mid-sized blades fit a wide range of kayakers and are versatile and easy to use during advanced maneuvers or all around touring. Werner's Smart-View Adjustable Ferrule System makes feathering adjustments a breeze. It comes in fish patterns with the Werner Hooked logo. I'm not sure if I just a bada$$ or this paddle is thin...it just flutters so much it's irritating! I'm leaning toward the latter. Otherwise it's great, lots of customization with the AFS, lightweight! I was a little suspicious of all the reviews and articles saying how the high cost for a carbon paddle was worth it. But Wow, I didn't know a paddle could make such a difference, the extra $$ for the Werner Shuna Hooked was worth it!! I upgraded from my starter paddle that came with the Vibe Sea Ghost 130 kayak the paddle length is 230cm and too short for someone close to 6' tall. On the water, I felt the difference immediately, Shuna weighs 27.5 oz. compare to the Vibe paddle which weighed in at close to 56 oz. the lighter paddle performed effortlessly pushed the 13 foot Vibe through the salt water flats and bay areas of northeast Florida. Keep in mind this Shuna paddle will be with you for many years and will outlast most Kayak's so the extra $$ is well worth the price for a high quality, light weight, fiber carbon paddle. Light, strong, looks amazing. I highly recommend this paddle. very lightweight and strong paddle. did some 30+ mile river trips and virtually no arm fatigue. highly recommend this line of paddles! I had no idea how much easier a lighter paddle would be to manuver. This one is amazingly light yet powerful. Definitely reduces load on your arms and is super sleek. This is my first yak paddle, I use it to push myself of banks, trees, docks, rocks. So far has not chipped, been scratched, or broke. It's light weight, the adjustable offset is nice especially in the wind. This is such a great paddle. Ive used it twice on big water and it was night and day to the other one I was using. TOP notch. I have had this paddle for almost a year now. At first, I was concerned that the fiberglass blades would not be able to handle the abuse that my Bending Branches Angler classic (plastic blades) took. But i have found that to not be the case. Its been well used in rough rocky rivers and it has held up great, it is a very well made and i expect many years of service. This thing is light at 27.5 oz. I'm not sore at the end of a long day like i was with my old paddles. It is truly a good value at this price considering how light it is. Do some "weight to price" comparing on other paddles and you will see what I mean. Overall I couldn't be happier, highly recommend. Wow, I didn't know a paddle could make such a difference. I upgraded from my starter kayak to a Cuda LT and realized my 230cm paddle was too short. I was using a Carlisle Magic Plus and it seemed like a reasonably decent paddle. Comparatively the Shuna is virtually the same blade shape as my Magic Plus. In my hands the Shuna felt lighter especially on the ends. On the water I felt the difference immediately. This paddle is incredibly light and moving up to a 240cm paddle in the Cuda LT made a big difference. Until now I never understood why people spent $200+ on paddles, now I do. I would definitely recommend this paddle. very light weight, and a positive reaction to each action applied, definitely a break form the norm. Very light paddle. Gives a lot boost to your kayak the way this paddle is shape. Werner Shuna Hooked Carbon Shaft/Fiberglass Blade Kayak Paddle: I would never have believed how much difference a paddle could make in the performance of my kayak, as well as my endurance, until I put the Shuna Hooked into service. I spend hours at a time in my kayak and typically paddle at least several miles each outing while fishing for both fresh and saltwater species. The lightweight but powerful Shuna makes my trips all the more enjoyable. New to Kayak Fishing, Bought this paddle cause I found out I am a high paddler. Used it 2 times so far and really like the feel and weight. Probably the best paddle for the money. I use this as a backup for my Werner Cyprus. Not as light or quite as smooth for connecting strokes, but well worth the money. Same blade profile. Buying the same paddle for second time, not because the first one broke, but because its a great paddle. I have been using it for year and a half. I have paddled 50+ miles distances per day with it and did not feel necessity to have a lighter paddle. Besides the ocean, it also worked on Floridas slow moving rivers. Very good product; great pleasure to paddle; be careful when paddling among rocks, a bit fragile at the end. Paddle arrived a little late, but nevertheless great condition. Q: I have had a 230cm paddle for many years; however, I recently purchased the FeelFree Lure 11.5 and now it feels cumbersome and unable to push the boat. What suggestions would you have? Does it need to be longer? A different shape? Thank you. Q: Does this paddle extend at all to comping ate for seat height? Also I'm 5'8 and will be purchase a feel free lure 11.5, what paddle length should I get? A: Hey there, thanks for your question! This paddle does not extend. We would recommend you go with a 240 cm based on your height and boat width, but you may want to increase the length to 250 cm depending on your seat height. Q: I am a first time buyer and am planning on buying a kayak mostly for saltwater fishing (Ocean Kayak - Prowler BGII). I am not quite sure which style of paddle nor length to buy. I picked this one because Werner claims this is for "a more aggressive style of paddling for those with more performance aspirations" and I suspect a higher angle blade will allow me to maneuver coastal waters with more ease as opposed to a paddle with a lower blade angle.. but I'm no expert. I also have read that I will be able to stand on this kayak as well but I don't want to carry two different paddles unless I have to. After looking on google, I stumbled upon a competitor's website that recommended a 220 cm paddle based off my height (5' 6") and the width of the kayak (34"). Based off this information, my questions are: 1) Is this paddle sufficient for what I want to do in coastal/bay waters or would you recommend a different style or brand? 2) Can I also use this in lakes/calm waters or is it overkill? 3) Is a 220 cm paddle suffice for my height and kayak width? 4) Can I use the same paddle to maneuver while standing up or should I buy a separate paddle? Could I just get the longer paddle or is there a hybrid paddle? A: If you are thinking abut standing up and paddling in your kayak I would go with a slightly longer paddle. Perhaps a 230cm. I like Werner paddles and Aquabound paddles (personal preference) there are many to choose from. You could also look into the Accent Hero Angler Adjustable Length Paddle or the Accent Transformer FX Slider Paddle. Q: I am new to kayaking and my only purpose is fishing and transportation to hunting areas. 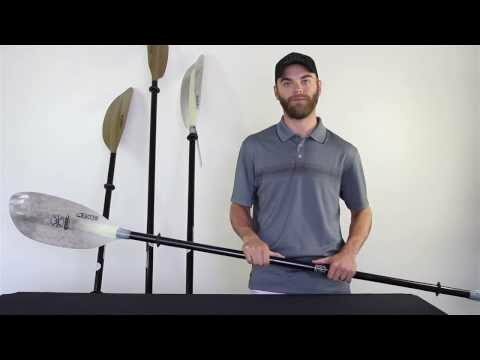 I am 5'9" tall 220 lbs and an active person ( sports, weights, outdoors) I have a pelican catch 120 and needed a recommendation on paddle and length? I will be on shallow rivers, big lakes, and trekking miles on both. A: Thanks for your question! With your boat your would want atleast a 240cm just due to the width of the boat. Any Werner product such as this is a great option. Next you want to look at shaft material; Aluminum is stiff and durable but if you wanted to upgrade to something lighter, Fiberglass is a great option and its warm on the hands. I do not think you would want to jump straight to the carbon material for your stated uses. I would check out the Werner Skagit Paddle, The bending branches slice glass, the werner baja paddle, and the Aqua bound sting ray, Hope this helps! Q: I am 6'2" and recently purchased a Wilderness System Ride ACK angler 115. The width of the boat is 33". I am new to kayak angling, but feel that the high angle stroke would probably be my preferred method of paddling. 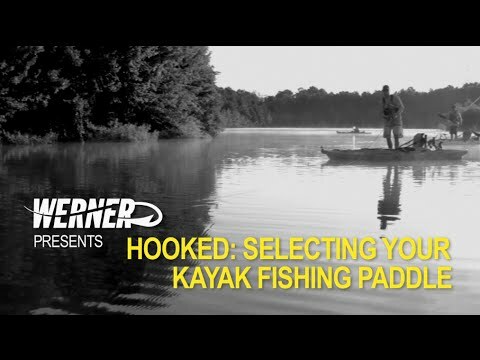 What size Werner Shuna Hooked paddle should I purchase? A: For your height and width of the kayak, I recommend a 240cm in this model.